This entry was posted on October 16, 2013 at 10:00 am and is filed under 2013 Giller Prize. You can follow any responses to this entry through the RSS 2.0 feed. You can skip to the end and leave a response. Pinging is currently not allowed. Alison has answered your question below. In the United Kingdom, the Booker Prize jury is required to “call-in” at least eight titles that have not been submitted (the publishers usually send letters saying “consider this one as well” — the rules allow them to recommend five titles in addition to those they have submitted) — the jury is allowed to call-in as many as 12. Yay! Very excited by this! The ‘real’ Giller jury is allowed to call in titles that may have not been submtted to the jury by the publishers (as they are limited to very few, 2 I think per publisher), so a call-in allows a jury to include a book that they want to consider that would otherwise be excluded. 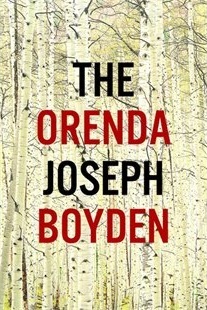 I too was very surprised when ‘The Orenda’ was absent from the shortlist, but it is also not on the Rogers Writers Trust shortlist, and I’d love to know the reasoning of both juries for leaving it off. Did they honestly consider (for example) Dennis Bock’s and Cary Fagan’s novels to be better books? I’ve not read the Boyden yet, but I’ve read Bock and Fagan and it seems highly unlikely. Yes, Boyden has won both awards before but is he now considered the kind of established Name of whom it would be fair to say “he’s had his go, time to give someone else a chance”? Surely awards should go to the best book even if that means one exceptional author winning repeatedly. But “calling it in” when it was submitted, longlisted, and left behind? Hmm… not entirely sure that is playing by the rules of the game, though I know why you’ve done it and think it will be very interesting to see if it “wins”, as I suspect it will given the decent but not stellar competition. After 18 years playing strictly by the rules, we figured it was fair to “play with them” just once. Mainly it was because we wanted to read and comment on the book. One of the reasons that I have enjoyed the Giller for all 20 of its years is that the longlist always contains names that I don’t know — and more often than not I find those books to be of value. If they left enough time between the long and short list, we would probably look at the possibility of coming up with our own. As things are now, there isn’t even time to get books to Trevor and Kim so they don’t really get started until after the shortlist is out. And I don’t think the Shadow Jury will be standing out like a sore thumb this year either — as I mentioned in the post, Catton’s Booker win (after she didn’t even make the Giller longlist) already has started some controversy.